If you've read me for any length of time, you'll know that I don't make wearable muslins. In fact, I daresay I have never made one. This time round though, I did. The interesting part about this classic button-up shirt is that the muslining part was more for the construction than for the fit. I used this awesome tutorial from MimiG (do you read her? you totally should) about using the measurements from a RTW item to make the fitting adjustments for a sewing pattern. What's even more interesting is that I actually own a RTW button-up shirt that I can actually take measurements from. I don't usually wear button-ups because my broad upper back makes finding RTW button-up shirts seem pretty much impossible. If it fits in the upper back and arms, then it's drowning me in the waist or if it fits in the waist I can't put my arms out in front of me to, like, drive a car. You know, usual story. As you can clearly see here though, we've got the arms in front of me pretty good. This is Simplicity 2339 - first time I've used one of those simply Amazing Fit patterns. I'm pretty impressed with this pattern, have to say. Its your standard button up beauty which actually includes a button placket, cuff and collar stand. The only thing it does not include is the sleeve placket or tower placket, as I've also heard it called. Lucky for me, there was a recent Threads article on just this thing, including a pattern for one of them so for my next version, I'll be adding it. These Amazing Fit patterns are pretty cool. This one in particular has different bust sizes and I love the dart shaping (you have the option to eliminate the vertical dart in the back and front too to make a more classic look - silk shirt here I come!) and like I said in my last post about pants resources I've had really great luck with helping others with various body types fit into the pants from this particular line. Confession time: I'm now a different size on top. I was a 34" upper bust for a long time and now, wouldn't you know I'm a 36". Aging, I guess. Crazy thing is I'm not any bigger anywhere else. Waist and hip stayed the same. Still, I thought I would point it out. This is now the second time that I can remember changing pattern sizes (not counting my teenage years). Fresh out of college and on the brink of starvation I was a pattern size 10 in the bust (Big 4) then I moved into a 12 bust for some years and now I'm a straight up 14. Also, since I have the broad upper back thing, I went with the straight size 14 instead of sizing down for ease - this really really helped that. I actually didn't have to make my broad upper back alteration and am happy that the shirt is fitting quite well. Still need to tweak just a bit for the broad upper back thing (does it ever end?) but this shirt is totally wearable. Oddly enough, this is one of the harder things I've sewn. I remember when I was in my teens and I was way into sewing in high school and my mom told me that my aunt had made a classic shirt before - this defined her skill as a sewer because you know, this kind of stuff is the big time. Peter might make this look easy as pie (I'm pretty sure he should be teaching course on shirtmaking and all of the different ways you can construct this baby), but I can tell you putting that stupid collar and collar stand together and then attaching it to the shirt is like precision sewing at its finest. Welt freaking pockets are easier than that! Bound buttonholes are easier! I'm sure it will be a miracle if I can do a sleeve placket. The cuffs only took me the better part of 2 hours. All this to say that my sewing on this first jaunt is definitely not up to par. Hence wearable muslin status. There are many mistakes on this shirt - the collar stand extends out beyond the shirt front, the button placket was put on backwards, I didn't do flat fells (just serged that stuff, ha!) and even though my machine does fantastic buttonholes, this time round we did some serious fighting. I even inadvertently put the buttonholes on the men's side of the shirt and its really rather hard to button up and unbutton. Definitely not my best, but I'm actually OK with this. I have a bit of a tweak or two to do to the pattern. Usually it does take about 2 or 3 tries to get the tweaks out of a pattern for me - is that the same with you? Do you make wearable muslins? What about wearable muslins only for the construction aspect? In other news, January has been kind of a wash of glumliness (my own word, thank you). We've had sooooo much snow and cold weather here in SLC, Utah and what's worse is that I haven't actually seen blue sky and sunshine for over a month. I hate that! It gets me feeling down and dumpy, but I'm going to be OK, I guess. Groundhog Day is tomorrow and if there's one thing that I absolutely love, its Groundhog Day! Such a silly day, but so completely up my alley of ridiculousness! Phil better predict warm weather or I'll have his hide. Also, my hair is awesome. Wait, let me say that again - My hair is awesome! It takes about 5 seconds to do everyday and actually, I could probably just skip the hair dryer for good. Oh and if you are dying to know, my skirt is from J.crew, my tights are old Anthropologie and my booties are terribly terribly comfortable and they are from Payless. Honestly, I pretty much wear every muslin I make because I use cheap fabric and I'm still pretty much a beginner. I'm afraid that if I didn't make a cute muslin, I'd get bored! I've been pretty lucky though with my muslins and been able to wear a few out. In fact I blogged about this same topic last week! Oh, and I love Christian Siriano! The shirt looks great! I like that it's a simple blue stripe that works for work (well, I'm always thinking of that because I'm a desk monkey) but you made the pocket and the plackets different. I wouldn't dare try to sew a dress shirt; I'm still getting the hang of sewing silk! I like this shirt! I gave up RTW shirts a long time ago and now that I have finally learnt to make buttonholes I am looking forward to making some, though I'll pick an easier pattern. I grew up wearing my older brother's hand-me-downs and, whilst I wouldn't call it childhood trauma, to this day I am still confused over which side buttons go in mens- and womenswear! I made a button-up blouse the other week and had to run upstairs to check a shirt in wardrobe - only I realised it was on the hanger inside-out, so I was looking at the wrong side anyway! I ended up writing it down for future reference. That shirt looks amazing. Bias pockets, yay! Cuffs give me nightmares. I just did a notched collar on a jacket, which wasn't awful, but the bulk of the fabric hides some of the crap sewing. I believe in a wearable 'semi-muslin'. I usually make up a true muslin to check all major fit issues, dart placements, etc. Then I make up my first version (semi-muslin) of the garment. I usually do this with a slightly less expensive material, but one I don't mind wearing out and about. I often find that I will try things on at home, maybe wander around a bit, and things feel great. It's when I start to walk to work or go shopping, whatever, that I realise that it's just a little bit too low/high, short/long. These get translated into the next version. When I run out of space, these semi-muslins are the first to go, but I will happily wear them for a few months. I know its been a week or so since you revealed the new hair, but damn girl, that hair looks great on you!! Your shirt really looks fantastic! Fabulous fit!! I love the idea of the Simplicity patterns, I've got one too but not used it yet. It would be super in silk. 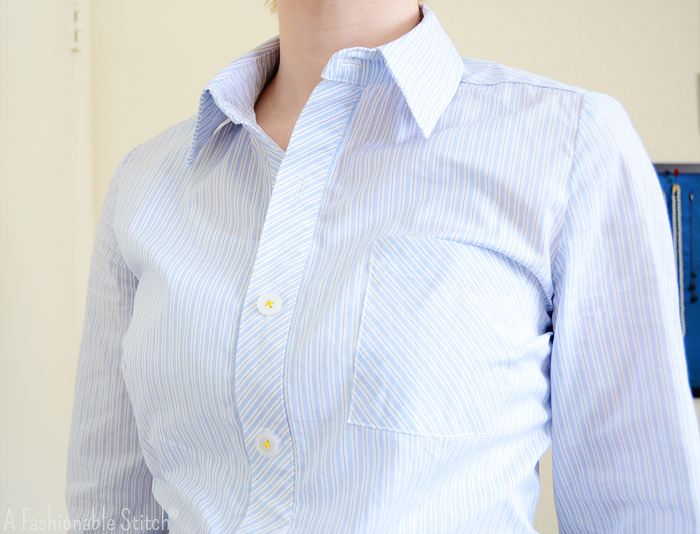 The sleeve placket is actually pretty straightforward, well, compared to attaching the collar band to the shirt! I just made my boys shirts for Christmas, and it took 5 attempts to get the collar band on one of them! I almost gave up!! I love that skirt. That is one of my favorite colors. I am really loving your haircolor, too. I am getting mine dyed red today. Also, I took your advice and tried an Amazing Fit pants pattern. It fits me very well. I am so excited. I've found they all get easier/faster with practice (as with most things, I suppose). Also, if you have great resources for quality shirting fabrics, I'd love a post on that. My local store never has anything worth buying for shirts. i've been working on dress shirts for my husband recently, and yeah---those collars are definitely the hardest part! i don't mind the sleeve placket as yours is on a woman's shirt, but for the record, the tower placket is FAR and away easier than the collar. nothing to fear there! they're a bit deceptive with all the folds, but i would say it's more on par with a welt pocket. maybe easier. david coffin's book on shirtmaking is a great resource to have on hand also for all the tricky bits. i've been looking longingly at leather for a cordova also... can't wait to see yours! I have been working on this shirt for the past 3 weeks and I'm about ready to pull my hair out. I'm a beginner and somehow thought it was a good idea to try to tackle this. I haven't gotten to construction details yet because I can't get the fit right. Sadly I don't have a well fitting shirt to measure. I guess I'm stubborn; I refuse to move on to something else with the pile of muslins mocking me from the corner of my sewing room. You've got the fit spot on. I can't wait to see the silk version. Question: What range of motion should I expect in this shirt using a non-stretch woven fabric? Man, your "muslin" would be my final product!!!! Just curious, what machine do you sew on? I'm in the market for a new one and I'm gathering info. Thanks! That looks great, fantastic shirt. I made that pattern a while ago in silk charmeuse and am very happy with it. I did modify it to have a hidden buttonhole placket. Those Amazing Fit patterns work well and I always recommend them. Don't despair -- it will be Spring before you know it (or that's what I've been telling myself)! I've used that pattern and was really happy with the results. I did the version with the 3/4 sleeves but I plan on doing long sleeves eventually. I love your version - it looks beautiful from here! This is amusing to me as I also never do wearable muslins (I either make one or I don't, and whether I do or don't there's usually something I'd like to tweak the next go-around)> However I just did one last week and it too was a blouse. Though nowhere near as sharp and complicated as yours! :D And the color of that skirt is totally drool-worthy. I'm kind of lusting over something that color in wool! This whole outfit is gorgeous! I absolutely love it, and your hair too. I've been growing my hair out of a similar style to yours for the past year, and I'm still tempted to get it cut again when I remember how easy and quick it was to style. Great job on your blouse! You meant business with your sewing plans for this year! I do read Mimi, she is just amazing, and that post was really good, although I don't always have something comparable that I like in my closet to measure from. Your whole outfit is great. I absolutely do not feel guilty buying what I can't sew. Your hair is looking great, and your eye shadow, too. Wow, this looks great! Thanks for posting those helpful links. I've been wanting to get a better button-up shirt pattern (I used a BurdaStyle one, previously. Does the Simplicity one you used have set in sleeves or are they constructed flat? 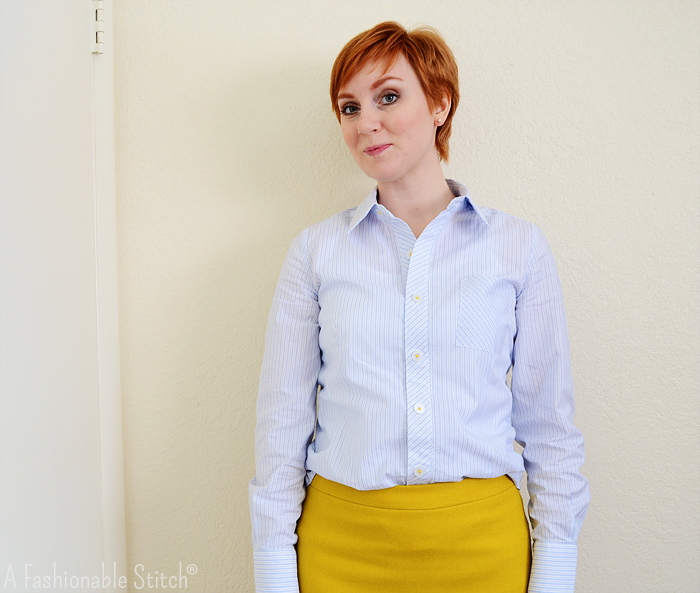 I also posted a tutorial on making sleeve plackets on BurdaStyle (http://www.burdastyle.com/techniques/easy-sleeve-placket--2). It turned out to be really easy! Shirts are hard, I agree. I made a button up shirt very early on when I was a brand newbie and I can't believe I persevered. Peter's shirt sewalong posts were really helpful for my more recent shirt makes. I still struggle with that collar stand. But yours looks fantastic. Love that you stitched on your buttons with yellow thread. I just may have to try that pattern out! Also, I love the outfit! Oh, how I covet that yellow skirt! I have some yellow double knit in almost that exact shade and I think I know what to do with it now. Thanks for the inspiration! This is a truly fabulous look for you - the hair, the booties, and *duh* the shirt. I've made one Amazing Fit pattern, for someone else, and I did like all the ready placed alteration lines, and the option for sleeve widening was great to have. Really helpful! January is over - that must mean spring is around the corner? It will come! First, your hair is indeed awesome! Second, shirting is my next sewing goal. Could you share some of the resources you used, books, tips etc you found useful? I have bought the Negroni pattern for my husband and I have a Kwik Sew pattern for me - for some reason I cannot bring myself to work on these yet, I am afraid they are beyond my level of sewing proficiency. You might not have seen sun in a while, but you are looking abso-freaking-lutely radiant! This whole outfit is incredible and I'm inspired by your shirt making. Also, I wish Australia had a groundhog day. 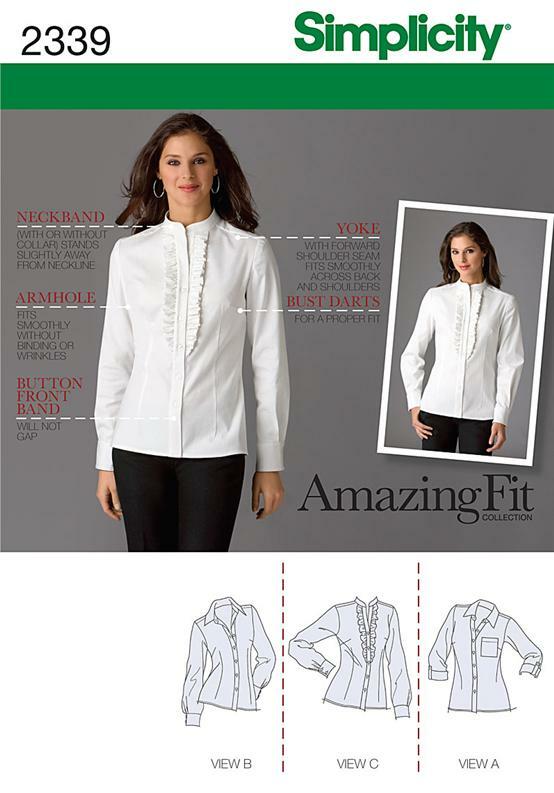 Great looking shirt and a perfect base for finding the perfect fit for you. BTW I love your new hairdo. This looks great! You definitely can't tell that you had any difficulty with it! And that skirt-- yum! I definitely understand why you couldn't resist it! You look gorgeous! I think the shirt fits you fantastic! I'd be pretty stoked if this was my final product - not just a wearable muslin! Also, lambskin leather Cordova... oh baby... totally in love with that idea! I've got my eye on a few hides myself for a moto style jacket, but we're already starting to warm up to our summer temps here in TX so sewing leather seems a BIT impractical... but I just might go for it anyway! Great job, I know those collar stands are not easy! Looks lovely on you! The yellow color makes my eyes pop with excitement. You look gorgeous. I love your shirt Sunni! It looks like a man's dress shirt but in a very feminine and form flattering shape! =PERFECT. Also: that skirt is to die for. I know it is RTW but geeze maybe I need to start shopping for some yellow wool or something. I just started with this whole muslin making process after realizing how ill fitting my first dress was (very neck-gapey, which I didn't realize was a thing until my dress). I think it will definitely take a few muslins to sort out. I have a limited amount of fabric to make my next dress with so I can't afford a screw up! I've never made a muslin of any kind, although there have been a few times when I wished I had! But I know me, and the thought of making something twice just to get one wearable garment...it makes me twitch. Having said that, I need to learn to do the opposite of what you're doing--*narrow* back adjustments. Muslins are probably the only real way to learn that. Bleh. I too just finally made myself a classic button down (well mine ended up with pearl snaps). Glad to know I am not the only one that battled with the construction! My pattern had horrible directions and I was trying to match up plaids. I do make wearable muslins once in a while -- usually when I have leftover fabric in my stash that isn't earmarked for anything else. 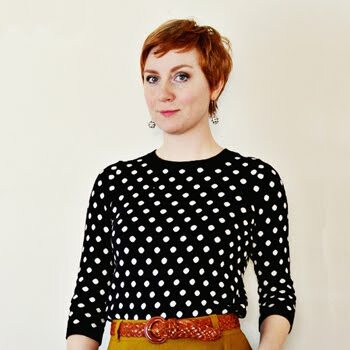 I made a linen Beignet skirt in summer 2011 and most recently, a Sencha blouse from some leftover dark blue crepe. I rarely have to make adjustments to a pattern so I don't often make muslins. I haven't visited in a while and when this post came up I said "WHOA!" out loud at my computer. Your hair IS awesome. Love it. It really flatters you and amps up the amazing style you were already rocking. I tried a pixie cut on me about a year ago and just couldn't rock it. It's perfect on you! Hey there! I've only recently discovered your blog, but as a very amateur sewer, sewist, or whatever it should be called I find your work very inspiring. I would love to work up to sewing a shirt or (gasp) a denim jacket. For now I have to practice with pajama pants and A-line skirts, but you give me hope of greater things. Also, I love your hair cut and the color. You look great and I envy you your style! Thanks for writing and sharing! Love your shirt. After making my two shirts in December, I know well how much work goes into shirtmaking. Well done! I LOVE this shirt!! It's kind of "boyfriend-shirt" looking, with the striped shirting, but so much better fitting which is a really great balance. I absolutely love it paired with the bright yellow pencil skirt - you look like a fashion editor. Perfect shirt. I'm not worthy!!! Congrats on such a nice garment. Loving the Anthropologie tights, and I cannot believe those are Payless boots. Nice!! Thanks for the shout out luv!